Say what you will about Los Angeles, it’s a great donut town. While everyplace else has been overrun by Dunkin Donuts, or Krispy Kreme, or Tim Hortons, Los Angeles is still chock-full of little family run donut shops, like the Daily Donut on Hillhurst, run by a Cambodian couple, who put their donuts in a pink cardboard box and reserve a corner seat for a local jazz pianist. And within 2 miles of Daily Donut you’ve got McGee’s Donuts, Highland Donuts, Kettle Glazed Donuts, K&C Donuts, Sam’s Donut Factory, and Romero’s Chicken and Donuts. It’s all hard to square with the stereotype that everyone seems to have of Los Angeles’ having homogenized the world. The city is quirky when it comes to baked goods. “What’s a donut?” she asked me. “Would I like it?” I was at once proud and dismayed at how thoroughly I’d insulated her from dietary sin. When I was 4 years old I knew very well what a donut was; in fact I’d already decided that coconut was my favorite flavor. Every weekend I trekked 4 blocks with my father to the Dunkin’ Donuts on North Avenue in Chicago, where we sank into such a sugar coma that my mother had to come and pick us up. To this day, whenever we pass a Dunkin’ Donuts, my father will ask if I want to split an old-fashioned. I don’t hold it against him. It came down to the wire. The trip didn’t go as planned and on our last day I had to drive all the way from Santa Barbara back to Los Angeles International Airport. CJ had only eaten half a bowl of cereal in Santa Barbara and after some delay our lunch date in Los Angeles had canceled. We were driving south on La Cienega, barely on schedule to make our flight, and CJ was so hungry that she was yelling and kicking the back of my seat. I handed her an orange. She lobbed it back. I told myself I couldn’t reinforce this behavior, but after a few minutes I realized I was being ridiculous. 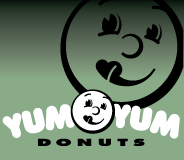 We pulled into the parking lot of a local chain called Yum Yum Donut. I asked them to make her an egg sandwich, but I was fooling myself. The donut trays are eye level for a 4-year-old. CJ was mesmerized. I told her she could order whatever she wanted and she took me at my word, ordering a donut with frosting, sprinkes, and cream filling. Cassie took a bite and within less than a second she wasn’t crabby any more. “But I like donuts better than anyone!” she announced. Next Who is a hero?